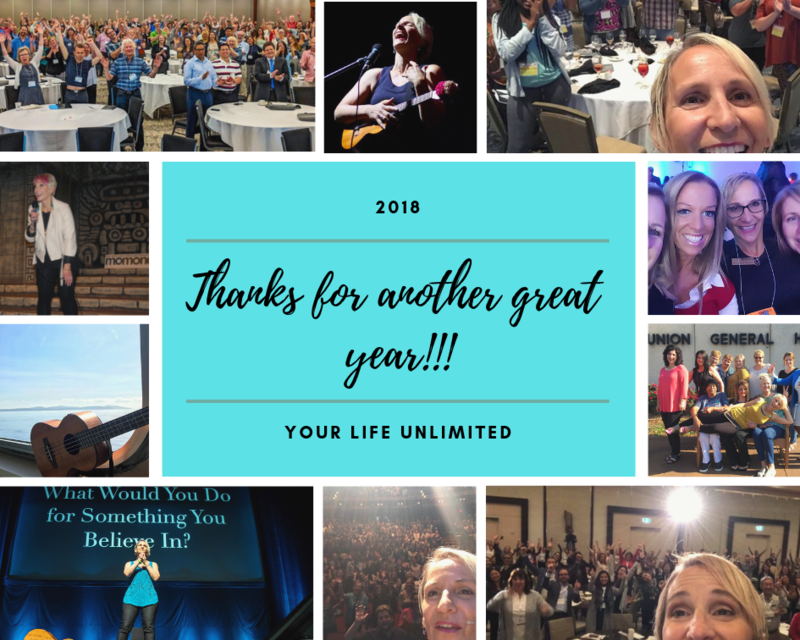 From Plastic Surgeons to Police Sergeants, from Nanaimo to Nashville, from fancy-schmancy corporate events like IBM in Las Vegas to quaint old movie theater events in small town North Dakota – I was blessed with another great year of sharing my message from the stage in all its various forms. We’ve shared laughter and tears and made many new friends. We’ve heard stories, told stories and created stories. I have empowered audiences and they have empowered me, I have supported others and I have felt 1000’s of people support me. My hope as I reflect on all the richness my calling has provided is that I delivered as much as I got back in return. I do this not to gloat but to promote what I do because the more people that hear and act upon my message the better. I do this as social proof so that if you are thinking of hiring me, I don’t want it to be me telling you what will happen, I want you to hear it from people who have already experienced me. I hope to lessen your risk – hiring a speaker is a big decision. When people can see via testimonials from others that time and time again I deliver value no matter the audience, no matter the industry, no matter the locale – that means a heck of a lot more to you than me telling you how great I am. • She brought the house down! • Pure contagious energy educational and entertaining. • A force of nature. • Positivity at it’s finest! • The highlight of the conference. • Completely inspirational and fun! • Real, relevant and deeply moving. • Like a morning cup of coffee, wakes you up and makes you happy. • Left us with a bucket of tools. • You will laugh, cry and definitely enjoy. • The audience was captivated. • Opened my eyes to new ideas. • Excellent quality and high value. • Playful tsunami of awakening energy. • You truly bring light into dark places. • Stephanie is a great investment with a substantial return! • So full of positivity! • Puts real perspective to leadership. • She opens your eyes. • She gives you the tools to succeed. • I highly recommend her. • Impactful, refreshing and inspiring! • A breath of fresh air. • Substance, poignant and engaging. • Entertaining with a meaningful message. • Fun, realistic and doable. • Would benefit any audience! • I learned so much. • Wow, she lifted me high! • So very in tune with the audience’s needs. • Incredibly professional and welcoming. • She captures my attention. • Inspired to be better than I am. • Spoke to my heart. • Each layer of her program is like an onion revealing something new, exciting and needed. • She is one of a kind! • The content in a must. • Has a knack of connecting with people instantly. • She lifted the whole crowd. • Incredible insight and inspiration. • Applicable to all areas of personal & professional development. • This lady has empowered me to make a lot of positive changes in my life. • Makes me want to become a better leader. • She pulls you in! • Steph provided us with more than we could have hoped for! • The message hit me hard, spot on! • A relate-able source of inspiration. • Had the audiences on the edge. • Dynamic and a vibrant ball of energy. • The things I’ve learned will make a difference in how I lead, it’s been life-changing. • We all left the ballroom feeling like we’d made a friend. • Open your eyes to a new way of thinking. • She makes learning fun. This entry was posted in audience feedback, Blog, Communication, Happiness and tagged audience feedback, Stephanie Staples, Your Life Unlimited. Bookmark the permalink.